Thousands of demonstrators will to take to the streets of London on Saturday afternoon to demand Mayor Boris Johnson deliver solutions to the capital’s deepening housing crisis. The March for Homes is a movement backed by various campaign groups, and draws together those opposed to government housing policies, which they say have driven rents to unaffordable levels, undermined social housing and caused a massive increase in homelessness. One contingent of protesters will assemble at Elephant and Castle in south London, while another sets out from Shoreditch in the East End. Both will convene at City Hall to rally for fairer housing. 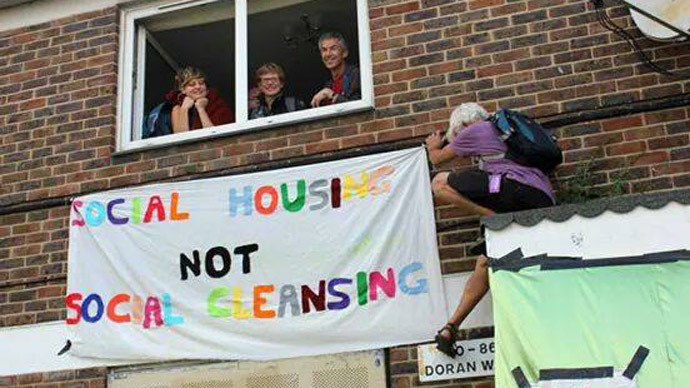 The East London leg will be led by community housing campaigners from Focus E15 and New Era, who made headlines in October 2014 after young mothers occupied empty social housing in the area. The march is also backed by tenant associations, trade unions and housing campaigns, London MPs and London Assembly members. Defend Council Housing, South London People’s Assembly, Unite Housing Workers and the Trade Unionist a Socialist Coalition (TUSC) have been actively building for the demo. Nancy Taaffe, TUSC prospective parliamentary candidate for Walthamstow, said: “Years of sell-offs, under-investment and welfare cuts have created a perfect storm, particularly for young people. We need to direct this storm to the door of the establishment which created the problem. “In the Labour years, the model used for housing was a form of 'Private Finance Initiative' (PFI). Lease deals forged an alliance of building firms, housing associations and public bodies such as schools, hospitals and libraries. Campaigners are demanding a cut in rent and an end to attacks on benefits, and secure tenancies for all renters. They also want to halt the demolition of good-quality council homes, and urge the construction of new council properties. They argue the housing crisis has been exacerbated by stagnating wages and the proliferation of insecure jobs and zero-hour contracts. Eileen Short, national Chair of Defend Council Housing, said the need to find a solution to the housing crisis was urgent. “The growing housing movement will not swallow hollow promises and more empty luxury housing. The London Mayor and councils must act now to control rents and invest in council housing,” she added. Exploitative landlords are also seen to be a large part of the problem, with the group accusing them of charging “exorbitant” rates. Alastair Stephens, of the People’s Assembly, said the public were in favor of greater rent control. The march is also counting on the support of left-leaning Labour MPs Diane Abbott, Jeremy Corbyn and John McDonnell.